In Here Comes Garfield, poor sweet Odie is sent to the pound after he and Garfield are caught trying to annoy a nasty neighbour, and it's up to the fat cat to free the dim-witted pup. In Garfield On The Town, Garfield escapes on a trip to the vet, has a run-in with some alley cats and meets his long-lost mother. Finally, in Garfield Goes Hollywood Garfield, Odie and Jon have stars in their eyes: they're auditioning for the TV talent.. In Garfield's delightful mystery film spoof, "Garfield's Babes and Bullets," the pudgy cat imagines he's Detective Sam Spayed, solving a murder case for a beautiful dame. "Garfield's Feline Fantasies" finds Garfield dreaming that he's everything from a submarine commander to a cowboy in search of the original fruit that inspired the banana-peel sight gag. Finally, the surly feline plays multiple roles in "Garfield: His 9 Lives," includi..
Get set for the first "Garfield & Friends" collection, featuring 8 episodes of the hilarious animated TV series starring that fat and sassy feline who lives for lasagne and can't stand diets, exercise and Mondays! Along with his not-too-bright pooch pal, Odie, and gullible owner, Jon, Garfield coughs up a hairball of humour that every human will love Each episode contains a Garfield sandwich, featuring two slices of "Garfield" and a che..
Garfield is back! Follow our tubby tabby as he takes the plunge and flees his comfortable cartoon world for the 'real world'. Escaping the boredom of cartoon life, Garfield soon realises that real life felines don't enjoy nearly as much fun as cartoon cats do... as blood thirsty Chihuahuas and body building canines challenge him at every turn. But with the help of some new pals and some trusted old friends, Garfield's wacky adventures t.. When Garfield and his friends are trying to enjoy a barbecue, little do they know that in a very different universe a battle is being waged! In a comic book world of heroes and villains, Garzooka and his trusted team of super-powered heroes, the Pet Force, must defeat the evil Vetvix, who is turning the inhabitants of their world into mindless zombie slaves! When the Pet Force falls into a trap set by Vetvix, it's up to Garzooka to enl..
Garfield: Fat cat Garfield spends his time snoozing, eating lasagne, watching TV and making wisecracks until his owner Jon (Breckin Meyer) falls in love with beautiful veterinarian Liz (Jennifer Love Hewitt). She convinces Jon to adopt the adorably dumb puppy Odie, who promptly turns Garfield's easy existence upside down. But when an evil dog trainer abducts Odie, it's up to Garfield to get off the couch and lead a heroic rescue mission..
Garfield: Fat cat Garfield (hilariously voiced by Bill Murray) spends his time snoozing, eating lasagne, watching TV and making wisecracks - until his owner Jon (Breckin Meyer) falls in love with beautiful veterinarian Liz (Jennifer Love Hewitt). She convinces Jon to adopt the adorably dumb puppy Odie, who promptly turns Garfield's easy existence upside down. But when an evil dog trainer abducts Odie, it's up to Garfield to get off the .. Fat cat Garfield (hilariously voiced by Bill Murray) spends his time snoozing, eating lasagne, watching TV and making wisecracks - until his owner Jon (Breckin Meyer) falls in love with beautiful veterinarian Liz (Jennifer Love Hewitt). She convinces Jon to adopt the adorably dumb puppy Odie, who promptly turns Garfield's easy existence upside down. But when an evil dog trainer abducts Odie, it's up to Garfield to get off the couch and ..
Breckin Meyer, Jennifer Love Hewitt and Bill Murray return in another adventure with America's favourite fat cat, and this time, Garfield's giving England the royal treatment! It's a British invasion of a different kind when Garfield, along with pals Jon and Odie, travels to London and meets his mirror-image in Prince, an aristocratic kitty who has inherited a fabulous castle. 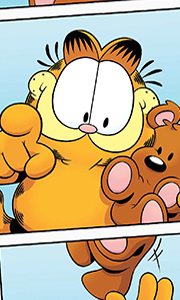 The two trade places, and soon Garfield is living large as o..
GARFIELD, long-running champion of Cartoon World's Fun Fest talent show, believes he can't lose with his winning comedy routine. Problem is, his sidekick (and girlfriend) Arlene wants to change the act. When Garfield refuses, Arlene partners up with the super suave new cat in town, Ramon, for a showstopping Tango. Not one for solo performance, Garfield loses his humour mojo! With hours ticking away till showtime, Garfield, with pal Odie..